Cardinals running back Rashard Mendenhall celebrates after a 1-yard touchdown run during the first half of Sunday's 37-34 overtime win over the Titans. NASHVILLE, Tenn. (AP) — The Cardinals care only about stacking up wins as they push for a playoff berth in the rugged NFC. Needing a few extra minutes is no problem at all. Jay Feely kicked a 41-yard field goal in overtime as the Cardinals edged the Titans 37-34 in overtime after blowing a 17-point lead late in the fourth quarter. "It’s not like the BCS," Feely said. "You don’t get style points. You’ve just got to win a game and move onto the next one and hopefully keep winning." Arizona (9-5) won for the sixth time in seven games. With San Francisco and Carolina winning, the Cardinals remain a game back of both for the second wild-card spot. They play at Seattle and then host the 49ers on Dec. 29 in the season finale. The Titans scored 17 points in the final 3:12 of regulation with no timeouts left to force overtime, with Ryan Fitzpatrick throwing two of his four TD passes to Michael Preston. They also recovered an onside kick to set up the tying TD with 10 seconds left in regulation. They won the toss and drove to the Cardinals 43 before Antoine Cason intercepted his second pass of the game. "They picked on the wrong guy twice too many times," Arizona coach Bruce Arians said. "Antoine’s been waiting his turn. It’s great to see him make those plays, especially the touchdown." 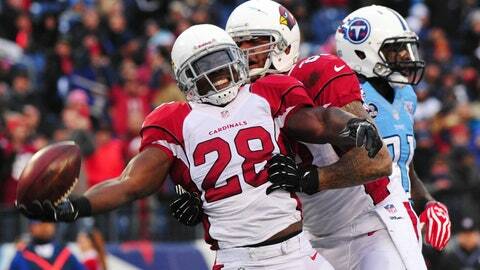 The Cardinals picked up three first downs before Arians sent out Feely on third-and-12 for the winning field goal. Tennessee (5-9) lost its third straight and eighth in 10 games. The Titans also lost their fifth consecutive home game for the first time since moving to Tennessee in 1997. "When you have a comeback like that, you’re not supposed to lose a game like that," Fitzpatrick said. The Cardinals scored 21 straight points in the second half, the last when Cason returned his first interception for a TD and a 34-17 lead. "We kind of laid down and relaxed, and they kept fighting," defensive tackle Darnell Dockett said. "That is a good situation to learn from." The Titans outgained the Cardinals 460-360, with Fitzpatrick throwing for 402 yards and Kendall Wright catching 12 passes for 150 yards just hours after new president Tommy Smith said he felt they hadn’t given up on Mike Munchak with the coach’s job security at question. But Arizona, which lost rookie safety Tyrann Mathieu to a torn ACL last week, sacked Fitzpatrick three times to go along with Cason’s interceptions. Rashard Mendenhall also ran for a pair of 1-yard touchdowns, and Carson Palmer threw for 231 yards and had a 6-yard TD pass to Jake Ballard. Cason recovered a botched kickoff when Arizona surprised the Titans with a short kick to open the third quarter, and the Cardinals turned that into a 47-yard field goal by Feely. The Cards turned their three takeaways into 13 points in a game with five lead changes. Arizona also made mistakes. The Cardinals didn’t have a single penalty in the first half but had four that gave the Titans first downs on a 16-play drive by Tennessee for a TD and a 17-13 lead in the third quarter. They also had a chance to kneel out for the win when Larry Fitzgerald went up high and caught Rob Bironas’ onside kick. Fitzgerald lost the ball, though, when hit by Titans running back Jackie Battle. Rookie Daimion Stafford recovered, giving Tennessee a chance to tie. Munchak said he was tempted to go for the win with a 2-point conversion, but instead he kicked the extra point to set up overtime. "I thought we had momentum on our side there and I thought we’d win the game," Munchak said. The Titans’ comeback came with only a few thousand fans still left in the stadium because so many left when they fell behind 34-17. NOTES: The Cardinals went 4-0 against the AFC South with the win, their first interconference sweep since realignment in 2002. … Arizona improved to 3-4 on the road this season. … Cardinals LB John Abraham had a half a sack, giving him 11 for the season. … Munchak deactivated receivers Justin Hunter and Damian Williams for violating team rules. Hunter, a rookie, was coming off the best game of his career and had topped 100 yards in two of the past three games. … Kenny Britt played and caught his first pass since Oct. 20. He finished with three catches.